After dithering for a couple of years, I finally picked out some new dinnerware. It's Denby Fire and the coordinating Denby Fire Chilli, English stoneware. It isn't cheap, but it is extremely durable. After examining the Denby at Macy's, I came home and created a spreadsheet of all the basic pieces and serving pieces, with color choices, and priced a bare minimum service for 8 -- dinner, salad, and dessert plates, cereal bowl, pasta bowl, and coffee mug. No serving pieces at all. Then I priced it. The total was, well, shocking. Macy's will have the Denby on sale this weekend, 25% off -- but of course, when you add in our local and state sales taxes, it's only 16% off. Dismayed, I went online, where the picture changed completely. Chefs Corner was offering some of the basics at 35% off -- no sales tax, and free shipping. Shepherd Hills had "factory seconds" of the salad plates for 60% off (they also have firsts). And the mugs and cereal bowls I wanted were on eBay...brand new, from a highly rated shop in Maine. If I get them at the price I bid (and there were no other bidders) even with shipping they'll be close to 70% off retail. It will take a few weeks to have all this stuff shipped from the various vendors (Chefs Corner has a three-week delay while they order from the Denby factory) but I'll be paying exactly half of the retail price. High quality stoneware, with only half the guilt. And I even bid on a serving dish! Whoo-hah. hey! 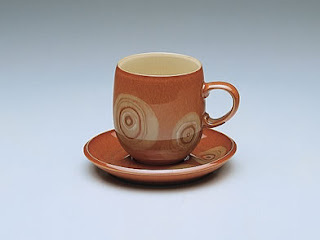 loved your tips on denby seconds! i'm thinking of ordering from shepherd hills... were you happy with your order? The Shepherd Hills dishes are great; you'd never know the seconds are seconds! And the Denby Fire and Chilli was worth all the effort of bargain hunting. Especially the mugs. They are beautiful and so comfortable to hold.